Steve grew up on the outskirts of Sydney on 5 acres with horses, ducks, chooks, cats and dogs. He knew from a young age that he would one day either run-away or work on a cattle station in the Northern Territory, or become a vet. After graduating from Sydney University in 1992, Steve worked in a dairy cattle practice in Gippsland, Victoria, spending the days delivering calves and treating horses. After 18 months there, Steve then travelled overseas returning to Australia in 1997 and starting work at Balmain Veterinary Hospital. In 1998 Steve successfully sat examinations in Small Animal Surgery, and was admitted as a member to the Australian College of Veterinary Scientists. His main areas of interest lay within small animal surgery, in particular orthopedics and reconstructive surgery. Steve's own experiences with skin allergies have left him with a keen interest in animal skin conditions also. 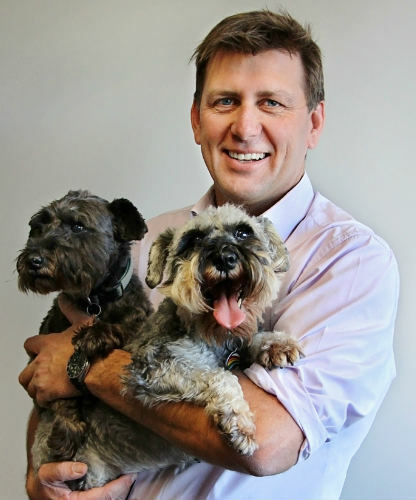 In 2000 Steve became partner in Balmain Veterinary Hospital and is a proud member of the team. He shares his house with his wife Christina, 2 beautiful children and Miniature Schnauzers Bindi and Tash. Steve has also recently added some chickens into the mix. Jason grew up on a wheat and sheep farm near Inverell in Northern NSW. A love of working with animals and an interest in science steered him into a veterinary career. He graduated from the University of Sydney in 1994 and then headed off for three years to work in mixed practices on the Murray River in Victoria and on the NSW coast. Jason then made the move to Sydney to focus on a career in small animals. 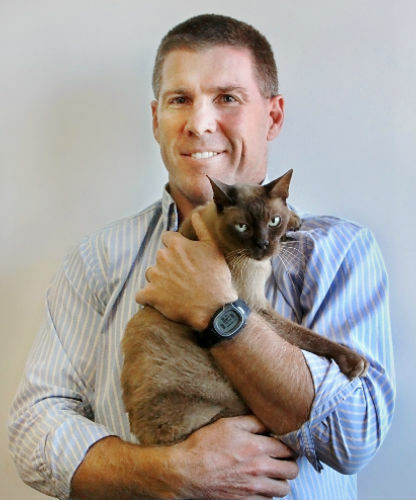 He worked in Sydney's Eastern suburbs until 2002, and then headed off overseas with his wife Chantay to work and travel, before returning in August 2005 to join the team at Balmain Veterinary Hospital. Jason enjoys rugby and cricket and coaches both at a junior level. Jason also loves playing golf and tries to not let it take up too much of his spare time. 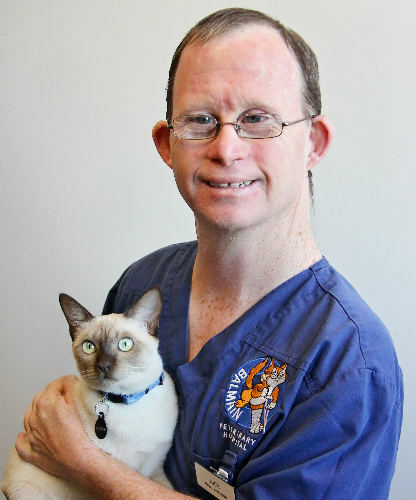 His veterinary interests include small animal medicine, surgery, diagnostic imaging and pathology. In 2007 Jason was admitted to the Small Animal Medicine chapter of the Australian College of Veterinary Scientists by examination, and again in 2018 to the Radiology Chapter after more exams. Jason and Chantay have 3 sons as well as Zeus the Burmese cat (who fancies himself as the practice cat when he visits) and Nibbles the Rex Rabbit. Ra (pictured with Jason) is unfortunately no longer with us, having passed away in 2018 at the ripe old age of 20. Nathan gained his Bachelor of Veterinary Science from the University of Sydney and began his career as a Veterinary Surgeon in a large, small animal practice in metropolitan Sydney. This gave him the professional grounding and confidence to embark on a 3 year hiatus to the United Kingdom where he gained further valuable experience in small animal medicine and surgery. 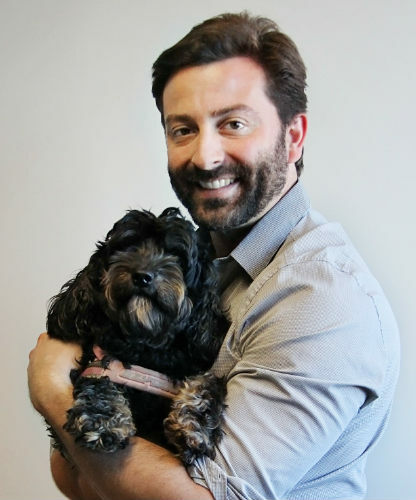 On returning from the UK, Nathan worked for a further 5 years at two inner Sydney Veterinary Practices before settling into Balmain. During the last 5 years he has been active in pursuing further education and has completed a post graduate qualification in Emergency Medicine. This set the agenda for completing further examinations in Internal Medicine, and in 2010 Nathan gained his Membership in Feline and Canine internal medicine and became a member of the Australian and New Zealand College of Veterinary Scientists. Nathan is also an Australian Government accredited Veterinarian, enabling him to assist clients in the export of their pet to overseas destinations. Nathan's professional interests lie in medicine and soft tissue surgery, both of which he is passionate in practising. Nathan enjoys serving the community of Balmain, Rozelle and Lilyfield and prides himself on providing the very best advice and care to both you and your companion. Danielle has had a passion for animals from an early age, and has always had a house full of animals. She graduated from the University of Melbourne in 2002 and worked in a large and busy small animal practice in Melbourne with a focus on canine reproductive medicine, fertility medicine and genetics. She also worked at one of Melbourne's largest veterinary emergency and ICU hospitals. She joined the team at Balmain Vet Hospital in 2010. Along the way, Danielle has done post graduate study in emergency medicine and sonology. Danielle enjoys all area of veterinary medicine, and has been fortunate to work with many different and interesting species, but has a special professional interest in small animal soft tissue surgery and management of diabetic patients. Danielle now works part time at Balmain Veterinary Hospital while raising her 2 young human kids and her "furkid" Muffin, a Cavalier King Charles Spaniel. She is an avid horse rider and equestrian showjumper and spends every minute of her spare time advancing her jumping skills. Danielle is passionate about experiencing new adventures, having travelled extensively through Africa and South America, she has been fortunate to encounter some fabulous wildlife. Grace grew up in Shepparton, Victoria and spent much of her childhood at her grandparent's dairy farm. She graduated from James Cook University, Townsville in 2014 and started work in a busy mixed practice in Mansfield, Victoria. After two years of delivering calves in the snow, Grace decided she needed a change of scenery and moved up to Balmain Veterinary Hospital. Grace enjoys all aspects of veterinary medicine. She particularly enjoys clinical pathology and internal medicine. Grace regularly takes part in continuing professional development and attends seminars and conferences. This year Grace will be undertaking further training in clinical pathology, dermatology and ophthalmology. Grace enjoys playing and watching sport. She is a keen netballer and has recently taken up jiu jitsu. Angela’s love of animals started from a young age as she grew up looking after a variety of pocket pets. She graduated from the University of Sydney with first class honours in 2011. A 2 year stint in London allowed her to gain more experience in both general practice and emergency medicine. After backpacking around Europe she returned home in 2016 to join the team at Balmain Veterinary Hospital. 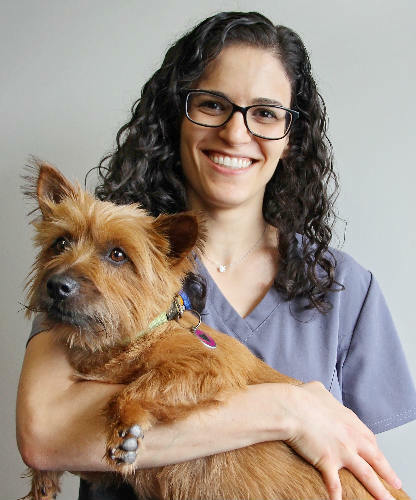 Angela enjoys all aspects of veterinary practice, especially dermatology and imaging. She is committed to ongoing education, regularly attends seminars, and spent 18 months on further study in small animal medicine. In her free time Angela is often out hiking, scuba diving or skiing. She is mum to a gorgeous, shy Birman called Nougat and a very cheeky rescue kitten named Soda. Jenna was born in South Africa and moved to Sydney at a young age. She graduated from the University of Sydney in 2011 with first class honours and spent the next five years working in a busy small animal practice on Sydney’s North Shore. Jenna loves the variety of general practice, but is particularly interested in ophthalmology and soft tissue surgery. She is committed to professional development and has completed distance education courses in surgery and oncology and is currently studying cardiorespiratory medicine. Jenna grew up with dogs of all shapes and sizes and now plays mum to two mischievous rescue cats, Dora and Boots. In her spare time she enjoys reading, cooking, doing puzzles, playing netball and spending time with her gorgeous nieces and nephew. Kara grew up in Sydney and graduated from the University of Sydney with first class honours in 2015. She has always lived with at least one dog in the house and spent four years working at the Cat Protection Society to cement her love for our feline friends as well. Kara has been working in small animal practice in the Northern Suburbs of Sydney before joining the team at Balmain Vets. In addition to this, she has been working emergency shifts for the Animal Referral Hospital and is interested in pursuing further study in emergency medicine. Since university she has been actively involved with the Australian Veterinary Association and regularly attends the national veterinary conferences and other continuing education events. In her spare time Kara enjoys fumbling her way through pottery classes, reading and baking. She visits her parents two Beagliers Kodi and Lena, at every possible opportunity and is a regular pet sitter for many favourite animal friends to make up for not having any of her own just yet. Tanya grew up in the regional town of Orange NSW and spent her childhood looking after a menagerie of animals on her family property. In 2016 Tanya completed a double degree in Bachelor of Veterinary Science and Bachelor Veterinary Biology. Since then Tanya has worked in Canberra in a busy small animal practice where she developed special interests in dentistry and soft tissue surgery. Tanya also has also spent time in various developing countries and remote indigenous communities of Australia, providing health care and free neutering to animals in need. 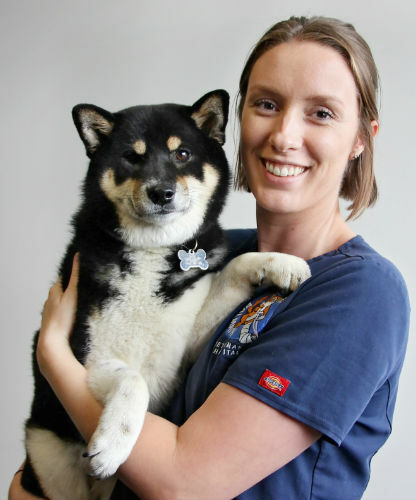 Tanya moved to Sydney in March 2018 to be closer to her partner, and joined the Balmain Veterinary Hospital team. In her time off Tanya enjoys cooking traditional Italian family recipes, heading outdoors with her rescue Labrador Harry, and going on adventures in Australia and abroad. 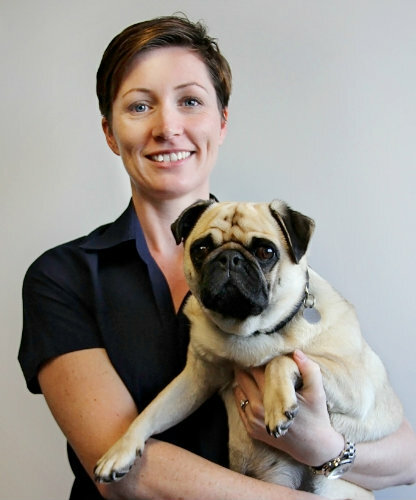 Moving to the city from Northwest NSW in 1999, Heather started at Balmain Veterinary Hospital whilst studying Veterinary Nursing Cert IV at Ultimo TAFE. After several years of nursing, she quickly realised that her real passion in the vet industry lay in the areas of management and reception, enabling her to mix not only with patients but their wonderful owners as well. After graduating from UNE with a Diploma of Veterinary Practice Management in 2010, Heather can now be found in the office taking care of things behind the scenes. Outside of work, Heather enjoys cinema, interior design, woodwork and bush walking. She shares her family home with a British Shorthair called Terence and Mr Poppers the Pug. Ara started working for Balmain Veterinary Hospital in 2002 and after nine years of full-time employment, her adventurous nature led her to Canada. 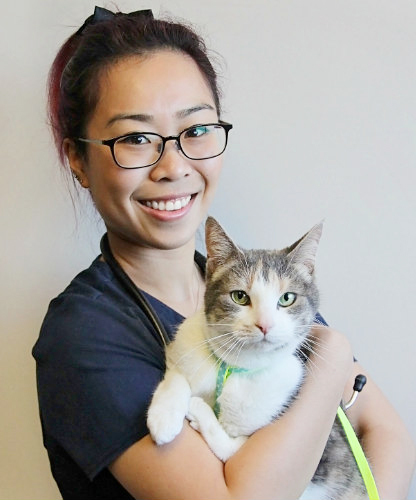 She had travelled throughout South East Asia, Africa and the Americas and eventually landed her feet in an innovative and progressive veterinary hospital in Burlington, Ontario. She was in a management role for a 5-vet 10-support staff veterinary practice before returning home in 2015 to start another chapter here at Balmain Veterinary Hospital. Ara lives with her partner and furry friends. She enjoys being social and meeting new people, travelling and experiencing new things in life. Her most memorable experience to date is doing volunteer work with elephants and orangutans and working on a spay/neuter program with the street dogs and cats of Thailand. Many years of experience working in the veterinary profession is what Ara brings to the team! 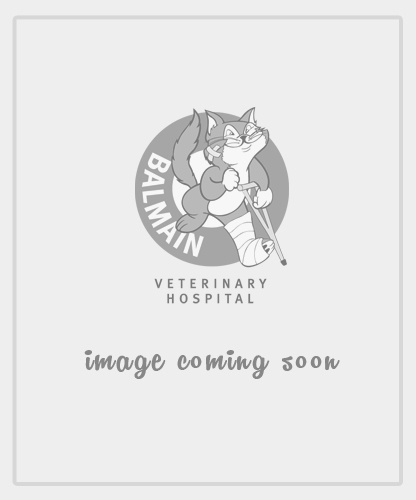 Marina joined the team at Balmain Veterinary Hospital in January 2008. Throughout childhood she regularly visited the family farm in Central Queensland. This provided the opportunity to work with many different large and small animal species, sparking an interest in working with animals from a very young age! Marina completed Certificate IV in Veterinary Nursing in 2009 and since then she has also attained a Diploma of Professional Practice Management through the University of New England to further her studies in the area of management. In May 2014 Marina received a Veterinary Nursing Accreditation awarded by the Veterinary Nurses Council of Australia, recognising individual competence, currency and dedication to the Veterinary Nursing Profession. In addition to working hands-on with our diverse patients, she enjoys her involvement in various administrative and managerial aspects of day-to-day hospital running. A sighthound lover at heart, Marina owns her very own lovable Whippet named Penny and in her spare time she pursues many creative interests including photography. Her photos can often be found on our Facebook page or website. After graduating from a Bachelor's degree in Health Sciences at the University of Sydney in 2015, Holly decided that her true calling was to work not only with people, but also with animals, something that she has wanted to do since a young age. Holly first came to Balmain Veterinary Hospital as a volunteer work placement student as part of her Certificate IV in Veterinary Nursing. As a lover of all animals, she grew up riding horses and begging her parents for pets. Eventually they agreed and her family now includes two Shiba Inu's Suki and Teiko, who she loves dearly. In her spare time Holly enjoys playing soccer, drawing, playing guitar and skiing or snowboarding if there is enough snow! As the only one in her family to have a real passion for animals, Albrina had always been seeking pets and wanting to help animals but hadn't had the chance to pursue that love with the time committed as a former international figure skater. Upon graduating a Bachelor of Design from the University of New South Wales, she decided it wasn't the career for her and it was time to return to that one thing she’d always been passionate about; that is, animals. 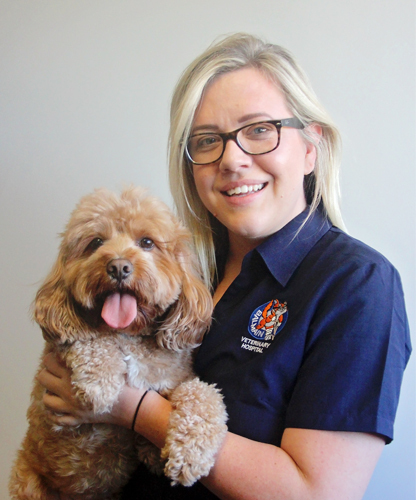 As a veterinary nurse at Balmain Veterinary Hospital, she hopes to help set and keep high standards of vet nursing in Australia and promises plenty of cuddles and the best of care for any fur-kids that come through the door. Her interests include horse-riding, road tripping and all things cats. Originally from a customer service background in Perth, Western Australia, Lana relocated to Sydney in 2013. 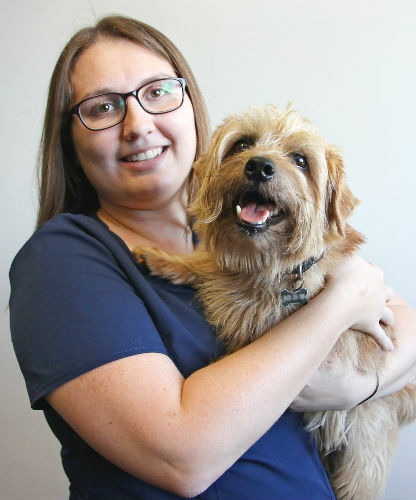 Seeing this as an opportunity for a fresh start, she decided to combine her desire for helping others and compassion for animals by pursuing a veterinary nursing career. Starting out at a large animal welfare organisation has allowed her to gain a unique perspective, empathy and kindness that eventually stirred up a passion for animal rights. Lana enjoys reading, meditation, attending industry related conferences and being active in improving animal welfare in Australia. She shares her home with her partner and a very cheeky ‘foster fail’ kitty called Terra. With a more creative background working in the make-up world, Casey soon realised she needed to pursue a career following her passion and love for animals and animal welfare. She completed her Certificate III in Animal Studies and started Certificate IV in Veterinary Nursing at a smaller clinic in Sydney before joining the team at Balmain. Casey has a passion for helping animals in need and spends her spare time volunteering at local shelters and rescue centres. She also spent some time in the Philippines earlier this year where she lived and worked at a dog shelter providing veterinary care to over 200 dogs rescued from the streets. Casey promises to go that extra mile and provide plenty of TLC to pets when under her care as if they were her own! She shares a home with her husband and one very spoiled Staffy x Kelpie named Lily. Sandy joined the team at Balmain Vets in 2012 after completing her Certificate IV in Veterinary Nursing through TAFE. She has a particular interest in anaesthesia and has undertaken several short courses to extend her knowledge. Sandy has always been a lover of animals and had several different pets growing up including rats, hermit crabs and rabbits. 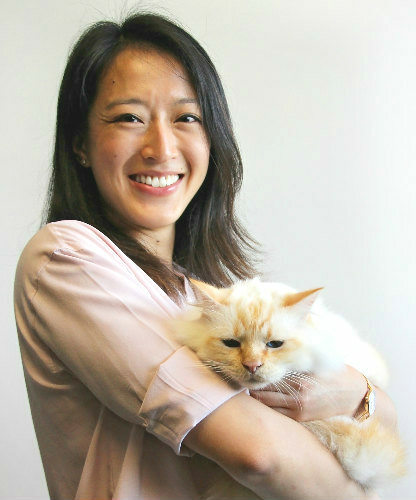 Shortly after starting at Balmain Veterinary Hospital, she fell in love with one of the kittens up for adoption and quickly adopted a white Domestic Short Hair named Jasmine. Sandy is currently trying to sell her apartment so she can buy a house and finally own a dog again! After working a brief stint at a specialist practice she decided she preferred general practice, where there is the opportunity to learn many different skills rather than just focusing on one and so she returned to Balmain Vet in January 2018. Apart from animals, Sandy’s other interests include travelling, especially camping and watching movies. Emilia moved from Sweden to Australia two years ago, leaving family and friends behind for a warmer climate and change of lifestyle. She has always been known for her affectionate love for all animals but has a special place in her heart for horses. Before arriving in Sydney she had high hopes of learning more about the dressage world in London where she spent twelve months working with some of the elite trainers and horses. Upon landing down under Emilia was lucky enough to work at Royal Randwick Racecourse which provided her the opportunity to travel to different race courses within New South Wales and New Zealand. This evidently paved the way into seeking a role within veterinary services as the hands-on assistance with vets sparked great interest and lead her to pursue a career in this field. She is now studying for her Certificate IV in Veterinary Nursing and is on schedule for completion by the end of 2018. Emilia lives with her partner in the Southern Sydney (unfortunately no pets!). During quieter periods Emilia enjoys beach life, horse riding and experimenting with different cuisines. From a very young age Laura has always been interested in and surrounded by animals. Before starting at Balmain Veterinary Hospital in 2018, Laura volunteered at Wirrimba Wildlife Sanctuary where she looked after the cassowaries, dingoes and all kinds of other Australian natives. Along with her father, she volunteered for several not-for-profit native animal organisations and worked with WIRES to rehabilitate all kinds of wildlife ranging from possums and birds to turtles and snakes. As well as being familiar with native and domestic animals, Laura has a background working with large animals on her family farm. She has been lucky enough to always have a dog growing up. She currently has two dogs, a Great Dane named Ruby-Doo and a Miniature Fox Terrier named Moose. She loves all animals great and small and is committed to giving our client's pets all of the attention and love they deserve. Hannah grew up in Hawkes Bay, New Zealand and her life long passion for animals started with the family cat Kofi. After finishing university, Hannah started working in hospitality in various roles and this enabled her to travel the world (a few times over!). The highlight of her travels was volunteering at the Elephant Valley Project in Cambodia, an organisation that homes retired working elephants. Whilst living in London, Hannah met her partner and they decided to move and settle permanently in Sydney. Hannah wanted a role that could combine her passion for customer service with her love of animals and has found the perfect balance of the two in her position as a receptionist at Balmain Veterinary Hospital. She enjoys meeting new people and giving reassuring cuddles to furry patients when they come through the door. Hannah lives in Bondi where she enjoys the beach and outdoor lifestyle. A cat lady at heart, she is on the lookout for a feline friend to call her own. Dianne has worked in the veterinary industry for almost 20 years. What started out as a serendipitous part-time job at the local vet to get them through a busy X-mas period has grown considerably. After spending 3 years there, she then moved on to reception at the Veterinary Specialists Centre for a number of years. And when the opportunity arose to join Small Animal Specialist Hospital (SASH) as it was starting up, she joined her friends there and had almost 9 amazing years with SASH, both on the front desk and behind the scenes. Prior to the veterinary industry, Di has a strong background in the corporate world but always with the focus being the client. Di is passionate about customer service and feels that each person who walks in the door, no matter where it is, should be valued . She loves interacting with people and the joy of adding animals into the mix, makes it a double blessing! Having got to know the vets and staff at Balmain Veterinary Hospital via her previous position, she was very excited to join Balmain Vets and continue in an industry that gives so much back. Di lives locally with her husband, Chris but the household is run by one very cantankerous and independent tortie cat called Pork Chop. Her three children and two grandchildren treat Ms Chop with a great deal of respect or suffer the consequences. They know she is a sweetie but she just has rules that not everybody understands! Growing up on a farm in South Australia, Victoria has always had a true love for animals. Whether they have two legs or four, feathers or fur - she’s in! Just keep her away from the no-legged or eight-legged kind, thank you very much! Her very first “what do you want to be when you grow up?” answer was a "vet". However, when her mum informed her that she’d have to give the sick animals needles she quickly changed her mind and her career path lead her to hospitality. After almost 15 years of management and operations working in different hospitality sectors, she decided it was time to quit something she’d never really been excited about and get into something she was truly passionate about. The love of her life, Jefferson the Cavoodle, helped Tory decide that her passion was and always has been, animals. Since leaving the farm, Tory has always had an animal by her side and is loving being surrounded by the people at Balmain Vets who have a passion to match her own. Tory and Jefferson are lucky to have a wonderful partner who is happy to deal with any eight-legged animals that should happen to creep into the house! After graduating from high school in 2016, Katherine has pursued her passion for design at the University of UNSW studying a Bachelor of Landscape Architecture Honours. Katherine’s ability to communicate with people and animals is a key attribute to her hardworking behaviour and positive attitude for the years she has been working with the Balmain Vet team. She is a proud owner of her birds Buddy, Loo Loo and Rocky. Katherine’s interest in wildlife conservation and the impact of climate changes on animals is something that she hopes she can become involved in through volunteering in the near future. Nick is a recent addition to the staff as an Animal Attendant. An animal lover since birth, Nick has two Border Collies Red and Nelson, who swoon at his feet and listen attentively whenever he speaks. He trained each dog and the locals all comment on how well behaved they are. Nick has been working since he left Glebe High (now Blackwattle Campus), 23 years ago. He's also a long time Inner Westie and known to many for his entertaining personality and his love of life. Never shy to comment, Nick has a very vocal relationship with the cats boarding at the hospital and often reports on his "interesting" conversations. The vet hospital is Nick's dream job, though he still harbours ambitions of working with the wilder animals found in Africa where he has been on safari on two occasions.